Stainless steel shackle head and compatibility with sharp fixing points. Ideal use for mainsheet systems and spinnaker sheets on dinghies, sportsboats and small keel boats to 8m(26ft). Also with halyard, vang and backstay applications on boats to 8m (26ft). 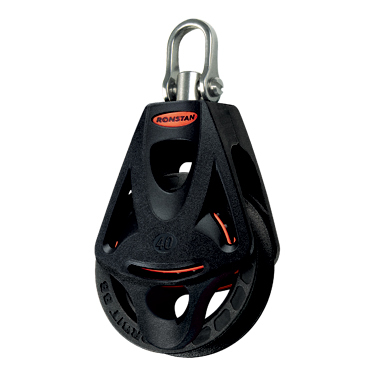 Sheave: Carbon fibre reinforced, PTFE impregnated Nylon. Head fitting: Grade 316 stainless steel. Stage 2 Bearing: Glass fibre reinforced, MoS2 impregnated Nylon.